The Florida Department of Transportation and Archer Western Construction received the 2018 Sustainable Practices Award in recognition of the innovative design-build team which proposed, engineered, and built a 16-ft. wide full-depth concrete shoulder to serve as an emergency lane along State Route 98 in Jacksonville. 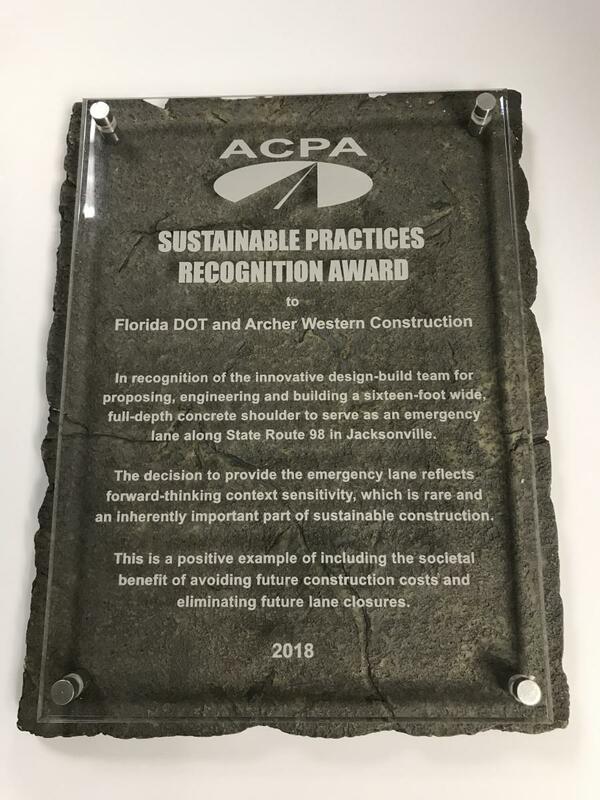 ACPA presented the 2018 Sustainable Practices Award to the Florida Department of Transportation and Archer Western Construction in recognition of the innovative design-build team which proposed, engineered, and built a 16-ft. wide full-depth concrete shoulder to serve as an emergency lane along State Route 98 in Jacksonville. The decision to provide the emergency lane reflects forward-thinking context sensitivity, which is rare and an inherently important part of sustainable construction. This is a positive example of including the societal benefit of avoiding future construction costs and eliminating future lane closures. A representative of Archer Western Construction accepted the award on behalf of the design-build team. ACPA's Sustainable Practices Recognition Award is presented to an organization or team (owner and contractor) that demonstrates leadership by implementing sustainable design and construction practices that consider societal, environmental and economic factors.